Old Port Harrisburg. Courtesy of the Portal to Texas History. Image available on the Internet and included in accordance with Title 17 U.S.C. Section 107. WILSON, ROBERT (1793–1856). Robert Wilson, entrepreneur and politician, son of James and Elizabeth (Hardcastle) Wilson, was born on December 7, 1793, in Talbot County, Maryland. His academic education was supplemented by training in the carpentry and machinist trades. He served with Maryland troops during the War of 1812. With his new wife, Margaret Pendergrast, he moved to St. Louis in 1819. The family moved to Natchez in 1823, and Margaret died soon afterward from yellow fever. The couple's two sons were placed with relatives. In Natchez Wilson became a successful contractor and also opened a mercantile business. By 1827 he had formed a partnership with William Plunkett Harris to operate steamboats along the Mississippi and Red rivers. Within a year Wilson had joined his partner's Texas brother, John Richardson Harris, in developing Harrisburg. By the time John Harris died in 1829 from yellow fever, Wilson was living in Harrisburg, where he owned a gristmill and sawmill. He was later accused by Harris's widow of fraudulently claiming much of her late husband's business as his own. Before her suit was settled in 1838, promoters Augustus C. and John K. Allen had dropped plans to develop their new city of Houston on this disputed site. Robert Wilson's Monument. Image available on the Internet and included in accordance with Title 17 U.S.C. Section 107. Wilson married wealthy New Orleans widow Sarah Reed in 1830. At some point he built two customhouses for the Mexican government, at Galveston and Velasco. In 1832 he joined fellow Texans in laying siege to the garrison at Anahuac. Wilson subsequently provided two ships to transport the Mexican troops at Anahuac back to Mexico. In 1832 and 1833 he was elected a delegate to conventions in San Felipe that considered Texas grievances. Wilson volunteered for the army in 1835 and became a colonel. After participating in the siege of Bexar in November, he left for New Orleans to raise money and volunteers. 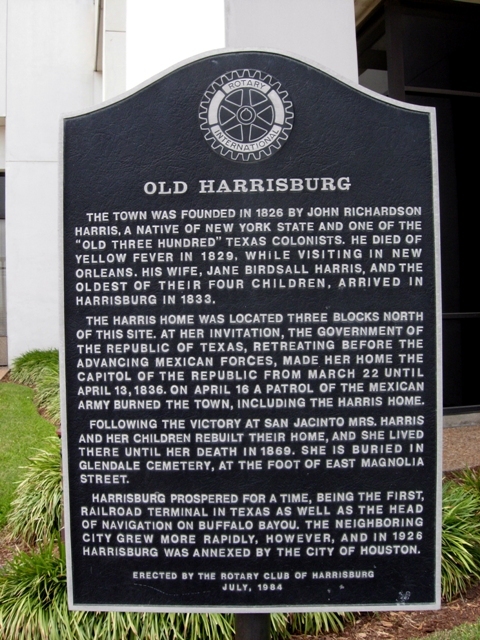 When he returned in May 1836, after the San Jacinto victory, he found that his entire livelihood at Harrisburg had been burned by the Mexican army. Wilson was elected to the Texas Senate in 1836 and served a three year term. He became associated with the Allen brothers in developing Houston and also promoted the town of Hamilton (which merged with Harrisburg in 1839) and a railroad. In 1838 he was a candidate (apparently self-announced) for president, but he received only 252 votes against Mirabeau B. Lamar's 6,995. In 1844 Wilson again quixotically ran for president but was ignored. The next year he was defeated for a delegate position to the convention that approved annexation. For the last ten years of his life he avoided politics and focused on the real estate business. His more successful son James Theodore Wilson twice served as mayor of Houston after the Civil War. Robert Wilson died on May 25, 1856, and was buried in a family cemetery in Houston. His remains were later moved to Glenwood Cemetery. "Account of the Campaign of 1835, by William T. Austin, Aide to Gen. Stephen F. Austin and Gen. Edward Burleson," Texana 4 (Winter 1966). Clarksville Northern Standard, August 14, 1844. History of Texas, Together with a Biographical History of the Cities of Houston and Galveston (Chicago: Lewis, 1895). John H. Jenkins, Audubon and Other Capers: Confessions of a Texas Bookmaker (Austin: Pemberton Press, 1976). Adele B. Looscan, "Harris County, 1822–1845," Southwestern Historical Quarterly 18–19 (October 1914-July 1915). Robert S. Maxwell and Robert D. Baker, Sawdust Empire: The Texas Lumber Industry, 1830–1940 (College Station: Texas A&M University Press, 1983). Andrew Forest Muir, "The Municipality of Harrisburg, 1835–1836," Southwestern Historical Quarterly 56 (July 1952). Andrew Forest Muir, "Railroad Enterprise in Texas, 1836–1841," Southwestern Historical Quarterly 47 (April 1944). Telegraph and Texas Register, May 21, June 11, 25, 1845. Handbook of Texas Online, Leslie H. Southwick, "WILSON, ROBERT," accessed April 18, 2019, http://www.tshaonline.org/handbook/online/articles/fwi56. Uploaded on June 15, 2010. Modified on August 2, 2017. Published by the Texas State Historical Association.